Manager Martin O’Neill has spoken about the challenge facing his team in tomorrow night’s friendly in Paris. 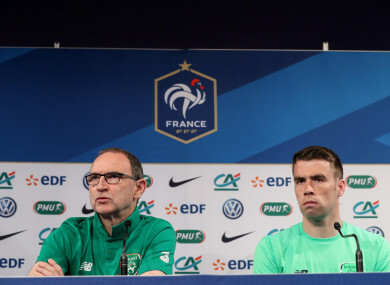 Martin O'Neill and Seamus Coleman speaking to the media today. JEFF HENDRICK WAS one of Ireland’s stand-out performers in France two years ago, but he won’t be available for tomorrow’s meeting with Les Bleus in Paris. The Burnley midfielder excelled in a green shirt at Euro 2016, where Martin O’Neill’s side reached the last 16 before going out to the hosts and eventual runners-up. Although Hendrick has been unable to reach those heights at international level since then, he remains a key player and looked set to feature in Monday’s friendly at the Stade de France. However, during today’s pre-match press conference, Martin O’Neill confirmed that the 26-year-old won’t play any part due to a back problem, but he may recover in time for the visit of the US to the Aviva Stadium on Saturday. This evening, the squad trained at the same venue that witnessed Wes Hoolahan’s famous goal in a 1-1 draw with Sweden during the most recent European championships, and while winger Callum O’Dowda sat out the session, he is expected to be fit. The French are gearing up to this summer’s World Cup in Russia and will face Ireland before friendlies against Italy and the US, before group games with Australia, Peru and Denmark at the finals. Didier Deschamps’ star-studded side is seen as genuine contenders for the tournament, and O’Neill feels his team have an extremely difficult task on their hands — especially given the large numbers of players inexperienced at this level in his squad. “I think the French are individually well-equipped,” he added. “France, when they get together, will be strong in this competition. They will be disappointed to lose the final of European championship, but overall they have as good a chance as anybody of winning the World Cup. Ireland are likely to field a team mixed with experience and fringe players tomorrow night, and O’Neill is glad he can continue to call on the services of 34-year-old Jon Walters, even if the now veteran striker didn’t play as much as he would have liked at Burnley this season. Bournemouth’s Harry Arter is another player who finds himself out of favour at club level at present, and the Ireland boss hinted that the midfielder is likely to be among the substitutes. “Harry has not played first-team football for some considerable amount of time,” he explained. “He was substituted, I think, about five weeks ago and since then he picked up little bit of an Achilles problem. “You know Jon’s history,” O’Neill went on. “He was probably our talisman for the Euros [qualification campaign], but since then he’s getting a bit older. I still think he’s important and he wanted to stay on. I’m pleased that he did because I think the younger players can pick up something from him with his attitude. “But again, as you get a bit older and don’t play as often and it does curtail your training programme and it becomes more difficult. You contrast that with some younger players, this would be as big a game as some of them might have played. Email “Hendrick withdraws from squad as Ireland gear up for 'big test' with star-studded French”. Feedback on “Hendrick withdraws from squad as Ireland gear up for 'big test' with star-studded French”.